Villa Bocaina Majanicho, Fuerteventura - The future for Fuerteventura? "That the whole island has been declared a Biosphere Reserve positions us as a world reference in environmental tourism"
Fuerteventura's recent statement by UNESCO as a Biosphere Reserve has been a giant step for the island concerning to its position in the world as a responsible tourism destination. Most of the biosphere reserves in the world are part of a larger area, however, in our case it extends over the whole island territory, and between 1.5 and 3 miles of the marine waters that surrounds it. This outstanding international recognition is a new and revolutionary attraction, which will mean a symbol of identity for lovers of nature who can be assured of finding in Fuerteventura a destination to enjoy a holiday in full contact with the environment and nature, as we know it is the intention of Responsible Travel's customers worldwide. Besides its incredible coastal scenery -there are many who believe that the best beaches of Spain are in Fuerteventura- the visitor interested in environmental tourism will discover in this island soon a vast natural and cultural offer complementing the possibilities offered in hiking, diving, popular festivities, etc. We speak of knowing not only unique landscapes like those found in the Natural Parks of Jandia, Corralejo and Lobos Isle, but also a series of cultural values associated with the ancient traditions of the culture of Fuerteventura that our visitors will know, either through the Island's Museums, or directly dealing with local people, always welcoming and ready to satisfy tourist's interests in every corner of the island. In Fuerteventura we want to defend a no-mass destination, sustainability of the territory and promotion, as established by the guidelines of UNESCO Biosphere Reserves, of economic activities that may be relevant for tourism, combining development and respect for environment and traditions. Our way must follow the path of a modern and enterprising society, who can combine facilities and quality services with natural environments, wild unspoiled beaches, or picturesque villages and ancient towns in which inhabitants still live like 50 years ago. In addition, Fuerteventura follows the line to improve in all matters related to clean energy projects, green transport, the existence of a network of rural tourism, etc. These targets are particularly visible in one of the projects that are currently under way and could give a definitive boost to Fuerteventura. This is the drawing up of the proposal to make Fuerteventura part of the Spanish National Parks Network, which is developing a team of eminent experts from 'La Universidad Complutense' of Madrid. The aim is to convert the 'Barlovento' Coast and the center of the island in the 15th national park, the first in Spain concerning an arid ecosystem, like prevails in the island of Fuerteventura. Fuerteventura has hit the international headlines with the Project for the Reintroduction of the Loggerhead Sea Turtle. The 'Silly' Turtle (Caretta caretta or Loggerhead Sea Turtle), disappeared from the coasts of Fuerteventura hundreds years ago, and through the development of the LIFE Project for Preserving the 'Guirre' (Neophron percnopterus), who after four years of fighting has managed to stabilize its population in about 170, the only ones left in the world. It may also be of interest to lovers of outdoor activity the creation of an island's hiking network. This is an initiative that has already started, and which focuses on the rehabilitation of a large path that crosses the island completely, from north to south, connecting on his way with 14 other trails that cross the island from side to side, passing through the main volcanic landscapes that can be covered on foot. This action will complement other aspects of environmental tourism we want to promote. Fuentes de El Chapadero-Montana La Muda-La Matilla trail. 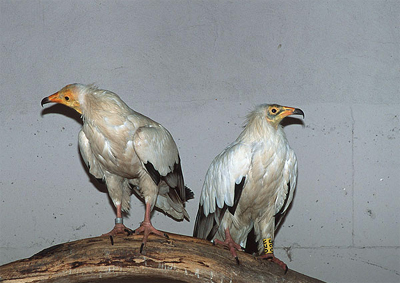 Birdwatching will be very attractive for those who want to enjoy an island which lies as the major way station for migratory birds of the Canaries, and one of most important in Europe among those used by millions of birds that arrive in Europe from Africa every year using the western route. The islands principal and most multinational resort, offering a wide range of activities and facilities. There is something for everyone in Corralejo. You can browse around the wide range of shops, enjoy the huge choice of restaurants and bars, swim in the clear turquoise waters lapping the sheltered white sandy bays, or the more energetic might want to splash around in the water park, have a go at diving, snorkeling, wind or kite surfing, book a jet ski, fishing trip or excursion on a catermaran. From the busy daily working port there are daily boat trips to the island of Los Lobos, regular ferries to Lanzerote and local markets every Monday and Friday. To the east of the town lie the Sahara like dunes of Corralajo Nature Reserve; stretching inland and south for more than six miles. The old town harbour area of Corralajo is a delight for those visitors wanting to relax in a more laid back atmosphere. You can amble along the promenade or sit and watch the boats coming and going from the harbour. The music square in the old part of the town is a favourite meeting place for visitors and locals alike, particularly in the evening when the place is buzzing with atmosphere. Whether you want a quiet and relaxing drink or take in a show, Coralejo's choice of bars and restaurants can cater for all! A very relaxed Spanish fishing village also populated by people of all nationalities wanting t6o enjoy the laid back way of life on the island. From the new harbour at the end of the main street, you can watch the local fishing boats coming and going and enjoy fantastic views across the bay; the sandy beaches to the left are a must for surfers and swimmers and those wanting to enjoy the miles of stunning cliff top walks. The bars and restaurants in El Cotillo reflects it's relaxed atmosphere and in the Old Harbour, which boasts an attractive promenade, you can sit and enjoy a drink on the terrace whilst taking in the spectacular views across the old town and out to sea. 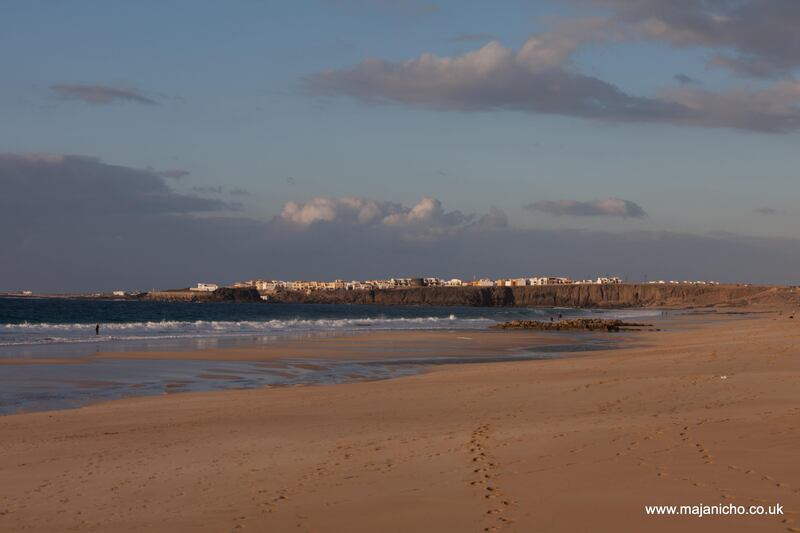 One of the main attractions of El Cotillo, is the lagoons to the north of the village; a group of powder white sandy coves and crystal clear blue sea, an ideal spot for families to idle away the time and enjoy the safe and easy swimming. El Cotillo lagoons and lighthouse. 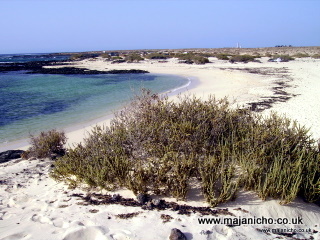 This hamlet, 15 minutes inland just a 10 minute drive from Villa Bocaina, was once the islands' capital. Although the grand houses are often seen to be crumbling, it is still worth a visit. 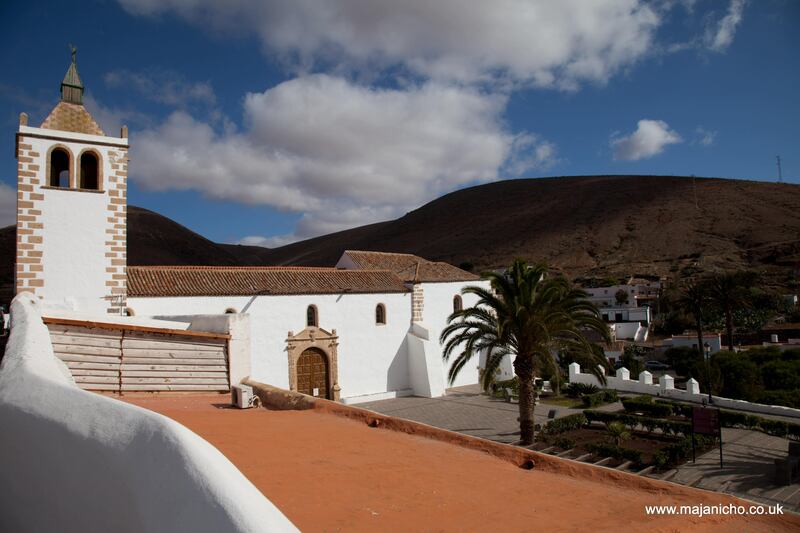 An attractive church and the Centro de Arte Canariao are well worth a visit. The Spanish clearly take their art very seriously and the exhibition makes for a very relaxing way to escape the early afternoon heat and enjoy the works of art on display. Casa de los Coroneles, La Oliva.